fall protection, and emergency planning. Anyone working at a height of 3 meters or greater is required to complete fall protection training. Go Safety’s Fall Protection Training is a comprehensive course of study that will provide you with the theory needed to work safely from heights. Once completed, you will be issued a certification of completion to present to your employer for their signature. NOTE: When employers couple Fall Protection Training with practical on-site training, such as Working at Heights, they will be considered to have completed their ‘due diligence’ and be compliant with OHS regulations. William Z. Verified Buyer The training examples are relevant and factual. I would recommend the training courses I took to anyone. Andrew B. Verified Buyer Fall Protection course very well done, good information, and a nice platform to work off of, I will continue to use this site for updating my tickets. Alex E. Verified Buyer This was a good site to get clear information on what I needed for fall arrest. Panko K. Verified Buyer It was a great opportunity for me to renew my fall protection certificate online at a convenient time. Luke S. Verified Buyer Easy to use and understand. George O. Verified Buyer User friendly. Very practical but crucial lessons pertaining to fall arrest. Affordable. 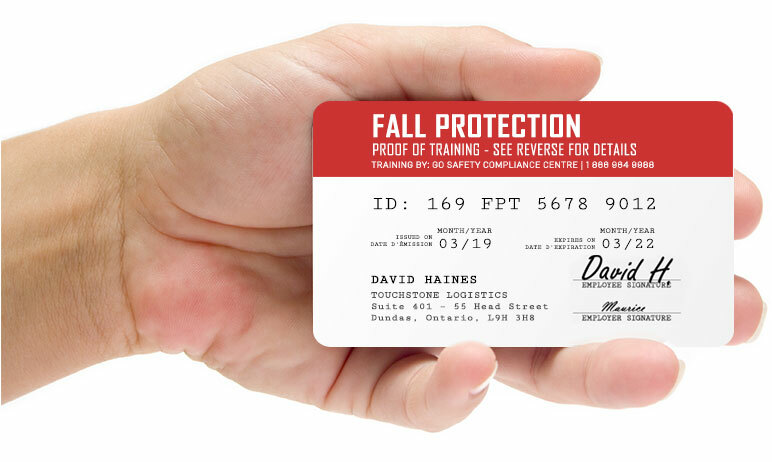 A printable certificate and permanent record of training will be available immediately after the successful completion of the Fall Protection Training course. A plastic, hard copy of your certificate is available upon request. Online Fall Protection Training can be completed at your own pace, in a total of about 4 hours. There is no time limit, take as long as you need. Exam attempts are unlimited. Access live student support from either our subject matter experts or our IT advisors 7 days/week via phone, email, and live chat. Individual training and bulk user management tools include progress reporting, access to past records of training and certificates, certification reporting/alerts, and much more. Immediately upon the successful completion of the Fall Protection exam, a digital certificate will be issued. This certificate can be downloaded from your account and printed at your convenience. Sign your certificate and ensure that your employer’s name and address are filled out and have them sign as well. There is room on the back to document any additional work-place specific courses with Subject, Date, and employer’s signature. A sturdy plastic Fall Protection Training certificate may also be ordered directly from Go Safety for an additional fee. These physical certificates are printed on durable 0.30mm polycarbonate plastic. Your record of training will be stored securely in your account for a minimum of three years should you need to reference it or provide proof of training. The record includes training details and completion date. WHAT IS FALL PROTECTION AND WHY IS IT IMPORTANT? No matter how thorough the safety precautions put into place on a job site, workers are going to fall. Fall protection training was developed in recognition of that reality. It teaches workers not only fall prevention but techniques to stay safe in case of a fall and to ensure the best potential outcome. WHAT TOPICS ARE COVERED IN THE FALL PROTECTION TRAINING COURSE? Hazards of working at heights. Eliminating or controlling fall hazards. The different types of fall protection equipment including anchors, lanyards, lifelines, harnesses, and how to choose the best one for your job duties. How to choose a complete fall protection system. How to deal with emergencies and create a rescue plan. WHO IS REQUIRED TO HAVE FALL PROTECTION TRAINING? It is also required for employees whose duties require them to work above machinery or an open tank. WILL I BE REQUIRED TO TAKE ANY FURTHER TRAINING? Whether you are required to take any additional training is based on provincial legislation and your employer’s safety policies. The Fall Protection Training course is meant to provide you with an understanding of the theories of fall protection. We also recommend you take additional practical on-site training such as the Ontario Ministry of Labour regulated Working at Heights course. If you require assistance to find on-site training, feel free to contact us for details. HOW LONG IS MY FALL PROTECTION TRAINING CERTIFICATE VALID? The period of time that Fall Protection Training remains valid varies from province to province. Please see your employer for details specific to your region. We recommend recertifying once every 3 years to make sure you’re up to date with changes in regulations and standards. HOW LONG DO I HAVE TO COMPLETE MY FALL PROTECTION TRAINING? Most students will complete the Fall Protection Training course in approximately 4 hours, but there is no time limit to finish your studies. You can pause the training program and pick up where you left off at a later date. Take as long as you need. Once completed, the training material will continue to be accessible to you for review purposes. You can write the exam multiple times until you achieve the passing grade of 80%. WILL THE FALL PROTECTION TRAINING PROGRAM WORK ON MY TABLET OR SMARTPHONE? Yes! Go Safety’s Fall Protection Training program has been developed to work on all major operating systems and web browsers. Your training may be taken on a personal computer/laptop, as well as most tablets and mobile phones. HOW CAN I ACCESS MY FALL PROTECTION RECORD OF TRAINING? 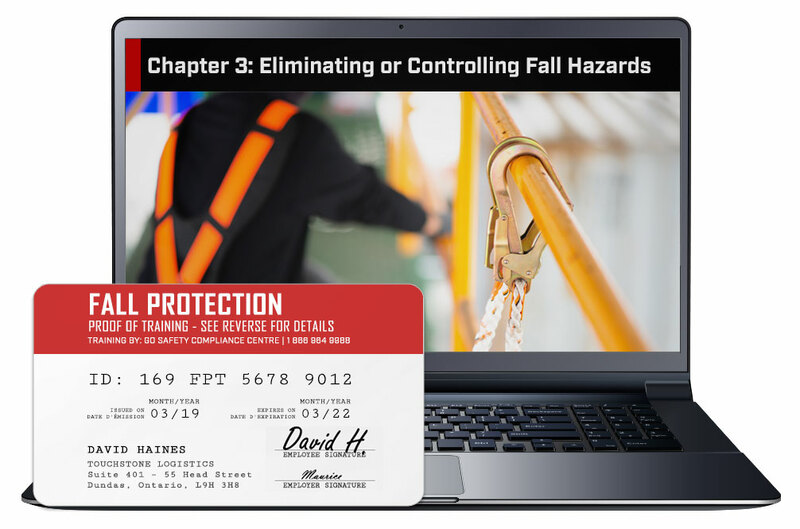 Your Fall Protection Record of Training is made available from your user account. This record is maintained by Go Safety for a minimum of three years and is available at any time. WHAT HAPPENS IF I LOSE MY FALL PROTECTION TRAINING CERTIFICATE? If you would like a hard copy replacement delivered via mail or courier, you can order one directly from Go Safety. There will be a small charge to cover the cost of postage, printing, and fulfillment. Please note your name, the name of the course, and completion date in the body of your email. CAN I PURCHASE FALL PROTECTION TRAINING FOR SOMEONE ELSE? Fall Protection Training can be purchased for others, including workers, students, and friends. Simply purchase the course and then assign it to a new user account after the transaction is complete using the Manage User panel.